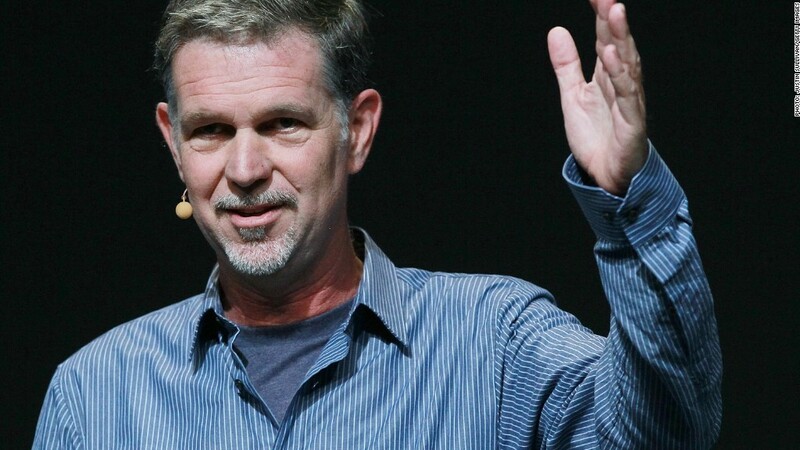 Netflix CEO Reed Hastings and his wife, Patty Quillin, recently signed the Giving Pledge. Netflix CEO Reed Hastings is one of the latest bigwigs to promise half of his family's wealth to charity through the Giving Pledge, a two-year-old initiative championed by Warren Buffett and Bill and Melinda Gates. Hastings and his wife, Patty Quillin, are among the 11 families that signed the Giving Pledge in September, according to a press release on Tuhesday. The pledge now covers 92 families. The Giving Pledge doesn't specify how the participants will donate their money, though the press release noted that Hastings and Quillin "are active in educational philanthropy and politics with a specific focus on charter schools." Hastings was the president of the California State Board of Education from 2000 to 2004. Netflix (NFLX) spokesman Joris Evers wouldn't discuss any of Hastings' specific favorite charities, saying that "we actually keep charitable giving and other activities that are not related to work very separate here at Netflix." He did add that Hastings is "very much into education." "We are thrilled to join with other fortunate people to pledge a majority of our assets to be invested in others," Hastings and Quillin wrote in a letter posted on the Giving Pledge's website. "We hope through this community that we can learn as we go, and do our best to make a positive difference for many." Hastings has made a fortune in Silicon Valley, but he's a comparative pauper in the Giving Pledge ranks. The initiative says it is "specifically focused on billionaires" -- a group Hastings appears to be a fair way off from joining. He doesn't appear on Forbes' Billionaires List, and his public stock holdings are in the multi-million range. Hastings controls around 4.4% of Netflix's shares, including stock options, according to the company's most recent annual disclosure. That stake is worth about $144 million as of Monday's closing price. He's also an active investor in tech startups and venture funds, and owns millions' worth of stock in both Microsoft (MSFT) and Facebook (FB). Hastings is on the board of directors for both companies. Still, Gates and Buffett aren't about to turn away any donors with a mere nine-digit net worth. The Giving Pledge's mission statement says it "borrows from past and present efforts that encourage and recognize givers of all financial means and backgrounds." The list of tech luminaries who have taken the pledge also includes Intel (INTC) cofounder Gordon Moore, Facebook (FB) cofounders Dustin Moskovitz and Mark Zuckerberg, Tesla (TSLA) cofounder Elon Musk, Microsoft (MSFT) cofounder Paul Allen, AOL (AOL) founder Steve Case and Oracle (ORCL) cofounder Larry Ellison.